Welcome to $100 Visa Gift Card and Gray Away Prize Pack Giveaway! Are you pregnant or looking color your hair without all the harmful effect of a real dye? Maybe you are stretching the time in between your next hair color too? Well Gray Away is not just for grays! It has many useful outcomes. Such as being pregnant and not wanting to subject yourself to a real hair dye. Maybe you want to see what you’d look like with a different color hair? You could simple want it for a touch up. Gray Away is perfect. This can be used for women of all ages as well as men. Ø Gray roots start to show only 2 weeks after hair coloring, Gray Away is an easy and convenient way to spray away gray roots instantly. Ø It extends the life of hair color saving both time and money. Ø Gray Away does not contain dyes, it contains mineral derived pigments and it is safe for everyone to use, even pregnant women! Ø Gray Away is a great value ($12.99 for 1.5 oz.) and is available in drugstores nationwide and online. This giveaway will have 4 winners. 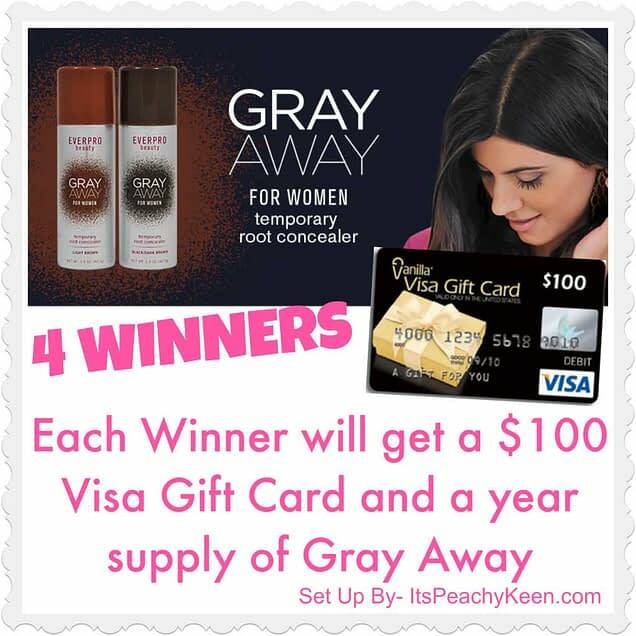 Each winner will receive $100 Visa Gift Card and a year supply of Gray Away product. They will have 24 hours to respond via email. Must be 18+ or older and open only to the US Residents only. Excludes Alaska and Hawaii. This giveaway ENDS May 3 at Midnight EST. Disclaimer: This blog did not receive any type of compensation or product for posting this giveaway. All opinions are mine and mine alone. This blog is not responsible for the prize or shipment mishaps that may happen. Gotta get rid of thr gray at my hairline. Thanks for the chance to win. Few gray hairs right in my part. I have a little bit of gray hair that I don’t bother covering normally. But sometimes I would like to temporarily cover it for a special event or something.